If there is an encounter you would like to do that is not listed, please email us with your request. We will do our best to accommodate you. We are delighted to announce HZG’s new partnership with “Kids Saving the Rainforest”. For every sloth encounter booking fulfilled through HZG, we will make a donation to this worthy charity. “Kids Saving the Rainforest” is dedicated to protecting the diverse wildlife of Costa Rica’s Pacific Coast by rehabilitating wildlife, conducting original scientific research, training volunteers, and promoting conservation. For more information, please click here. To make a donation, please click here. Katie has loved every minute and wants to come again. The kindness and consideration was amazing and the lovely lady who was with us. Barbara was brilliant and her love of the animals was evident. Just wanted to follow up and thank yourself and Barbara for a fantastic experience, Talita was brilliant and Hannah was ecstatic as you can see below! 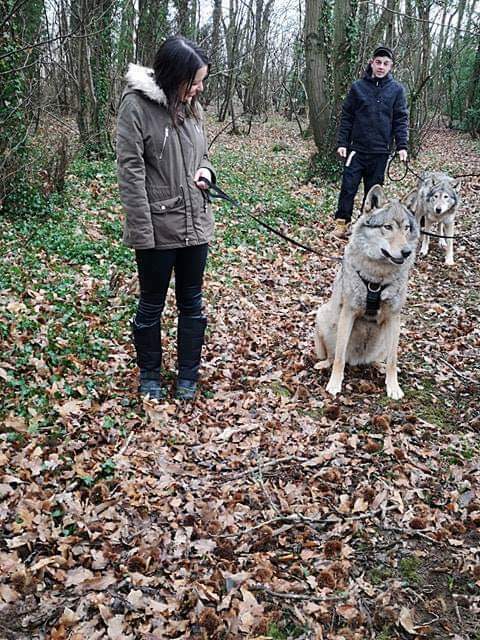 I just wanted to say what an incredibly amazing experience the wolf walking encounter was. My husband and I were blow away, we were lost for words when we sat back in the car afterwards! Beowulf and Logan were so well behaved and a real credit to Heythrop and their trainers. All the staff we met were so friendly and knowledgeable. This was our second trip here and we are already planning coming back again, just the difficult decision of deciding which encounter to go for next! Just wa nted to say thanks for such an amazing day yesterday and wanted to express how much we all enjoyed the day! Aaron attended upon us and he was so helpful, informative and friendly! We cannot express how much fun we had. We will 100% be returning soon! I just wanted to take the time to say thank you for such a wonderful encounter with Mitch on Saturday. It made Nancy’s birthday and everyone was really welcoming and friendly to us. We have never done an encounter before and it was far move memorable than imagined. Below is a picture Nancy did when she got home and I thought I’d send it to you. I just wanted to send a huge thank you to you and your team. We have just has the most amazing time. I can’t even describe how amazing and majestic this whole experience has been. The animals are so well looked after and the trainer with us today was so lovely. We will defiantly make the long trip again to come for a open day. I want to say a big big thank you for the sloth encounter Charlotte really enjoyed it and said it was the best present ever . Could you please pass our thanks on to Aaron who talked us through everything on the day he was very informative. Let me begin by saying how deeply grateful I am for giving my wife and I an opportunity of a lifetime. I wish I had words to properly express how much our visit meant to both of us. My wife had no idea what to expect… But when she realized she would be spending time with Talita….. The look on her face….. Melted my heart. My wife talked of nothing else for the rest of our trip. Barbara was so wonderful…. Taking time to explain things to us…. And answer or questions. Please share this with Barbara as well… So she knows the positive impact she had on our day….. Trip… And life. And that Talita…. Oh she is truly something special. It is very clear she is well taken care of…. And has a special bond with those who care for her. Thank you so very much for all the coordinating and time spent to ensure our visit turned out flawless. My wife and I thank you all for being such gracious hosts. I’m just writing to thank you and your team for providing a wonderful sloth encounter for my girlfriend last week meeting Talita. 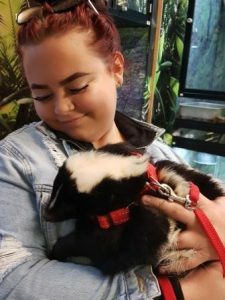 We were both really impressed with how well maintained the zoo was and how clean, happy and well cared for all of the animals looked. Please also pass on my thanks to Barbara, it was obvious she really cared for the animals and had a really strong bond with them. There wasn’t a question that Barbara was unable to answer and she was extremely informative, especially with her knowledge on sloths. Could you also send me all the information for all the other experiences you offer as I would love to gift some more experiences in the future. What an amazing day- Fox walking and an encounter with a squirrel monkey arranged as a surprise for our 7 year old. The staff were so lovely and patient answering so many questions. We felt no time pressure just allowed to embrace the moment . 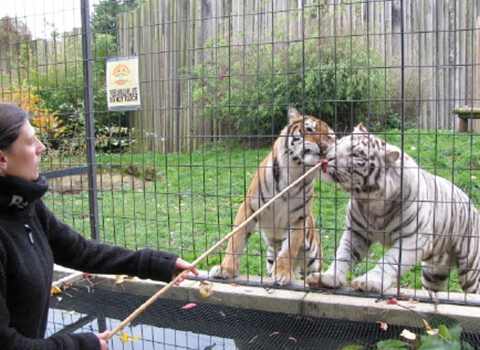 To experience something so special, with such beautiful animals was my sons dream come true . We are looking forward to going again…. We had a fantastic time on Sunday. Barbara was so lovely and very informative. The encounter exceeded our expectations and is something we will never forget. You will probably be contacted by both my daughter and myself for further encounters with some of your fantastic , and very well cared for animals. I just want to thank everyone at Heythrop Zoological Gardens for arranging the sloth encounter yesterday. We both had an amazing time and we were just amazed after leaving. 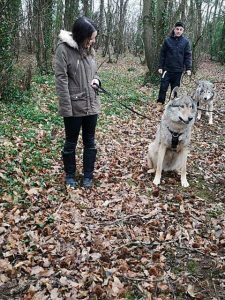 Also a big thank you to Christie, she made the encounter so brilliant, she was so welcoming and friendly and showed us around and talked to us about all the other animals and it just completely made the experience. You can just tell how wonderful this place is and how happy the staff and the animals actually are here, was just beautiful to see. Mike has never been so happy you literally have just made his dream come true. So thank you all so much. Will definitely be returning for the open days next year and for more encounters. Today we visited your facility for the “Sloth Encounter” after tracking you down via our great friend (Andy Gillham), all for our “Sloth mad” son – Sashka. Well, we had a 2pm appointment as arranged when I spoke with you on Monday this week. This experience was just outstanding. My wife and I would just like to thank you all so much, and especially Christie, who took us through the Encounter and was a wealth of knowledge, for making this experience for our son simply unforgettable, and as he has described – “the best day of his life”. Christie also led us out via all the other animals, and this was the icing on the cake for this absolutely perfect experience. Your instructions were simply perfect too, and although I knew we would be arriving early, I naively thought we could get a coffee or something, and wait around, but I totally understand now what you are all about. 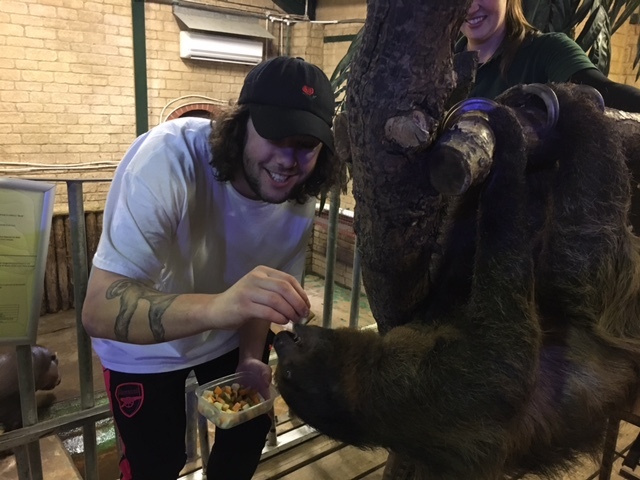 I have attached a couple of photos of our sons encounter – showing the sloth tattoo he has on his arm in dedication to his favourite animal. Once again Hannah, we cannot thank you enough for arranging this for us – it has made our sons life pretty much, and look out for him possibly trying to return one day for the work trial! Just a note to thank you and the staff for arranging the Sloth encounter for us on Tuesday. As I told you it was a 5oth birthday gift for my wife and your staff did a great job keeping it quiet, my wife had no idea right up until she walked through the door to meet the fantastic Talita. Christie gave us a small tour of some of the other animals on site and gave us an interesting insight into how it all works there. Barbara was great, gave us lots of info and my wife was very jealous as she thinks being paid to look after sloths must be one of the best jobs in the world! It was a round trip of about 150 miles for us (still easier than going to Costa Rica!) but well worth it and we have lots of pictures to remember the day. Talita was wonderful and my wife fell in love with her, we were very lucky to have a one to one with her as it made it extra special but I know the midweek booking helped that. Lastly thanks again for staying in contact and remembering to bring the date forward for me when your plans changed. Just wanted to say a huge thank you to you for organising the sloth encounter for my daughter on Sunday 27th August. We were very impressed with the whole experience and it was certainly a fabulous way to spend an afternoon. Christie’s enthusiasm, knowledge and obvious love for her job really made the day and we loved learning about all the animals, their personalities, antics and claims to fame. So please pass on our thanks to her also. Once again thank you for what will be fantastic long lasting memories for her. Just wanted to say thank you for the amazing experience we had at our sloth encounter yesterday. My partner was absolutely besotted with Talita and Christie was wonderful showing us around and answering every question we threw at her! It wasn’t hard to see that the animals were very well looked after and we were both really impressed by Heythrop. I would recommend it to anyone looking for a really special experience. Thank you so much for organising our visit today, they were so surprised and just blown away! We all had a great time, thank you to Emile who was so knowledgeable. I thought I would just drop you a line to say what a lovely time we had with Christie and Talita yesterday. Chelsie absolutely loved the sloth experience and Talita was in great form. 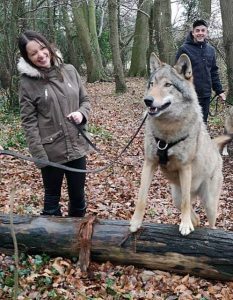 Christie was an amazing host, chatting to us very easily and sharing her vast knowledge of the animals and park with us, she did a great job and is a great ambassador for the place. Thank you again for all your help in making the experience happen. We will. Hopefully be able to visit again for one of your open days. Just wanted to say thank you so much for arranging the Sloth encounter yesterday – it was absolutely amazing! Can you also give a massive thank you to Christie for making this such a special afternoon, her knowledge of the animals is unbelievable ! – and of course a big thank you to “Talita” the star of the afternoon what a gorgeous girl! My nephew had a wonderful, memorable birthday – thank you so much. I just wanted to thank you so much for all your help in arranging the sloth experience. Sarah fell in love with Talita and we all had a really great time! Barbara was also amazing. She was so good at keeping the sloth a surprise I actually had to double check with her that I hadn’t made some sort of mistake. I was so impressed with everything, from the service throughout to the quality of the zoo to the knowledge that the keepers displayed just all of it! Its clear Heythrop really cares about their animals and it was just an amazing experience. I hope to visit again someday. “I want to specially thank Heythrop Zoological Gardens for the wonderful and exciting day. I was truly amazed about all animals being in great condition and are …clearly well cared for. I was happy to see each animal enjoying their environment which is extremely well preserved to originality. My encounter with Talita the Sloth was amazing and breath taking to get up close to her. I was speechless on how beautiful and fantastic she was with me. I would like to say thank you to Christie and Barbara for the memorable day, I will never forget my time at Heythrop Zoological Gardens. I am recommending you to my friends who are also massive fans of all animals. To end this, thank you to Christie and Barbara, but also Talita the Sloth for the magical experience. I just wanted to let you know what a fantastic time we all had last Saturday meeting Mitch and Talita. The encounters were brilliant and we were well looked after. It was a lovely personal experience and it made a change to not feel rushed. These days most things are operated like a conveyer belt, rushing everyone through to allow for more people and more money to be made. What a refreshing change to have someone take the time to make sure we had a wonderful visit and let us look at (and talked to us about) all the other animals on the way to our encounters. The staff were really friendly and informative, please pass on our thanks to them. I would love to return next year to participate in some more encounters, so I’ll definitely be in contact again. I just wanted to say a huge thank you to you, Tom and Emile. Myself and Phil had a fantastic time and we will certainly be back and be recommending you to others! We are huge animal fans so we’re like school children when we could see and hear other animals on site! We got to hear the lions roar as the wolves howling too! What an amazing experience we had! My partner thoroughly enjoyed himself, as did I, he said it was the best birthday present he’s ever had! He was bouncing in the car all the way there and back and hasn’t stopped talking about it. 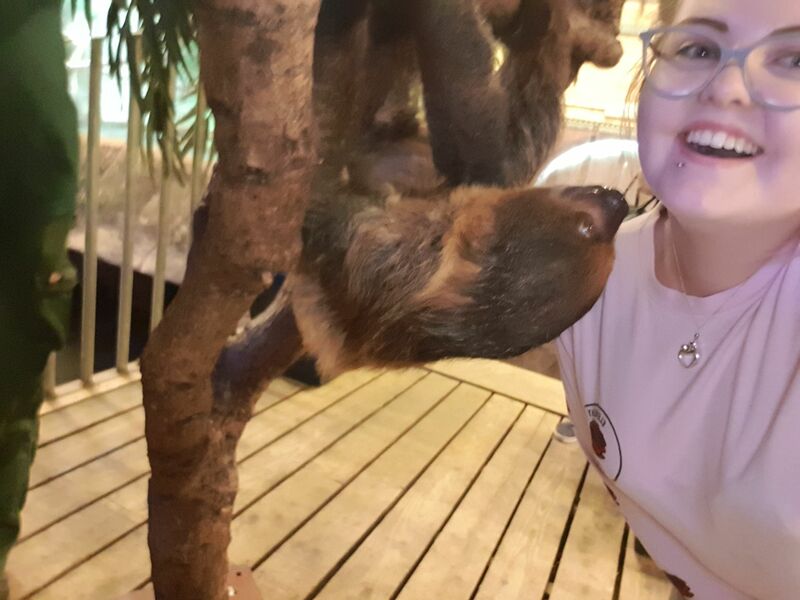 I just wanted to contact you to say a huge thank-you for your help in organising for Georgia to meet ‘Talita’ the sloth. What an amazing experience….. certainly one that she will never forget…… she is desperate to come again!! Please also pass on my thanks to Barbara for looking after us last week and being so kind, patient and informative to Georgia (in fact all of us) – what a lovely lady and a huge asset to Heythrop. 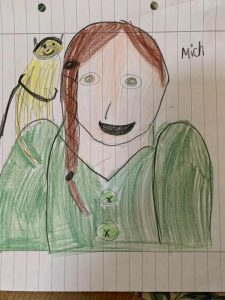 Once again many many thanks…… if Talita is clever enough to make any sloth babies in the future please do let us know….. and I have a funny feeling I will be in touch with you again in the not too distant future anyway!! We just wanted to say thank you so much to you, and all your staff for the most amazing day ..the encounter with Vera the Raven was an amazing experience, a beautiful Bird absolutely melted our hearts …Then to meet Beowulf wow! there are no words … amazing to walk with such a powerful animal to look into his eyes just to feel his energy,… it was totally breath-taking he really was the most beautiful boy ..Geoff was really in ore of him amazing…we got some amazing pictures of the day …something that will stay with both of us for ever … thank you all so much …. 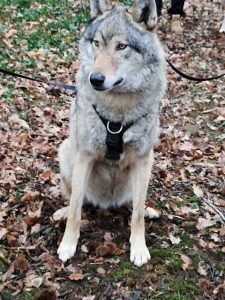 l am sure we will be back just to walk with Beowulf again … please keep us updated with all details and of events, Again ‘thank you’ a Day in our lives we will never forget.. I would just like to say a great big thank you to yourself and Barbara for the Sloth encounter on the 9th April! It was a wonderful day that was enjoyed by all of us (especially Kalon!) and I will defiantly be recommending you to many of my friends and anybody who is after an animal encounter. Barbara was a wonderful host and we really enjoyed all the information she gave us about the animals and the sloth that you have within your organisation. She was a very knowledgeable and wonderful host. I am sure this will not be the last time we will be visiting! 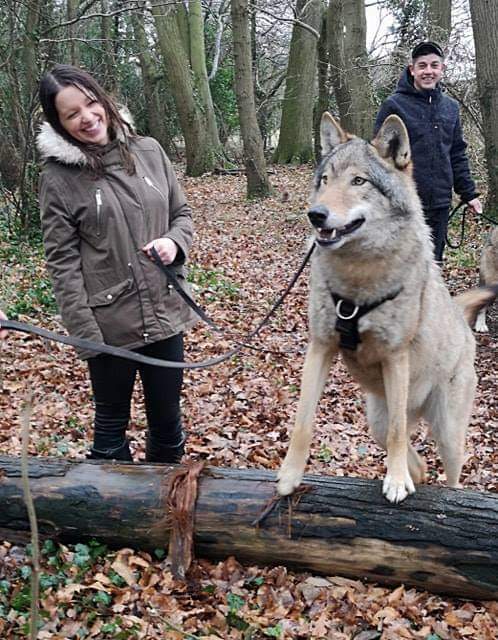 Thank you so much for the wonderful visit and wolf encounter yesterday! It really was amazing. Please thank Emile & Jerry (sp?) as their guidance, professional knowledge and understanding and friendly approach made this visit a really first class experience. It was great to meet you, the person behind the computer, and learn about all of the exciting things that make your job as unique as it is! Fancy swapping jobs for the day? Hope the booking form idea was helpful…please let us know if we can do ANYTHING to help at any time throughout the year. I have attached some photos I thought you might like to see. Just writing to say that me and Jason really had a great time meeting Mitch on Saturday plus the common monkeys. It was a real treat meeting Mitch and his mates who were all very much monkies in every way. I especially loved training with Mitch and feeding him his maggots which he loved. Mitch also gave Jason a present all down his shirt which was quite amusing. Also Barbara and the trainer was very pleasant ladies especially Barabara who were very chatty and lovely. I will deffinately be booking another encounter sometime with yourselves in the future. Good luck with all the future filming that you do with your animals especially Mitch. Saying that Barbara said Mitch was doing a horror movie which horror movie is he doing as I really enjoy horrors so would love to know so I can keep an eye out for the movie to see Mitch performing in it. I am writing to thank you for arranging our sloth encounter last Saturday and also to thank the amazing Barbara for everything!!! She was brilliant, knew so much about the beautiful animals you have at your zoological garden and was extremely kind and lovely to us all. It was fascinating to talk to her and I would like to thank her for her time & talking to us thus making this encounter with Talita extra special. We had an amazing time and even our little one enjoyed coming though she could not actually meet the sloth, but had a wander around down to the meadows etc. with her daddy meanwhile. We all loved your animals, the setup and most of all were so impressed with the passion of the staff at Heythrop. It is clear that you are all doing a labour of love there and going beyond the call of duty. Thank you so very much! If it’s OK we will most definitely recommend your company and do some good advertising on your behalf – especially for your open days in September. We will most certainly pay attention to the online booking in August so we can bring the whole family to enjoy Heythrop in September. “I just wanted to say an enormous thank you for arranging the Sloth encounter for Orla on Saturday. It was amazing to see her face when she finally met your beautiful sloth and she had a wonderful time stroking and feeding her . Barbara was the loveliest lady and it was an honour to meet someone so knowledgeable and dedicated to animals. Little Cian loved seeing the zebras and llama as we wheeled him through the stables. Such a fantastic day for all of us . Just wanted to email you to thank you for our a Fox Encounter on Saturday. We had a really good time, and everyone we met was really helpful and took the time to talk to us, show us round and answer our questions; special thanks to Barbara, Emma and Jess. We hope to visit you again. “Dear Hannah, Barbara and Talita!! Thank you so much for today. It was just unbelievable! It was such a fantastic day. Bev was Just amazed with the whole experience and to get so close to Talita was for her, mind blowing. It was just perfect. I cannot than you enough for this opportunity to see a Sloth so close. Bev is already making plans for our next visit!! Just wanted to drop you a quick email to let you know that we had an absolutely fantastic day today. Annabel had a great time meeting Talitha, it was a dream come true. Barbara really helped make the day special, so please pass on our thanks to her.